Four days after his release from jail, the Black Lives Matter organizer and activist opened the Brooklyn Hip-Hop Festival’s Hip-Hop Institute as the keynote speaker. 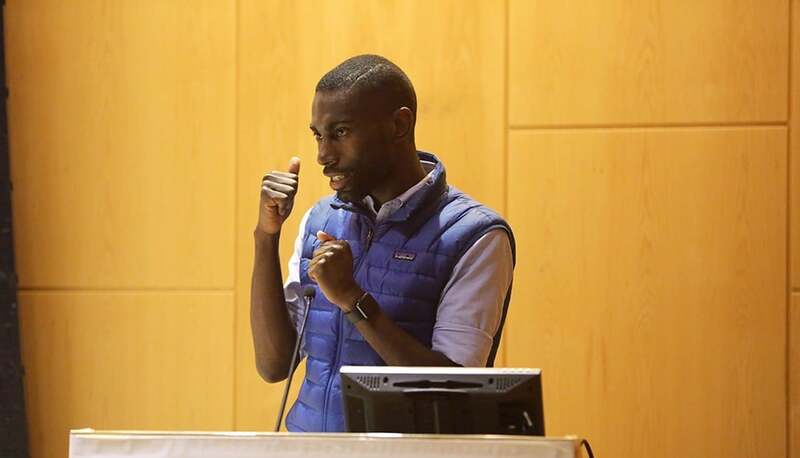 On Wednesday morning, Black Lives Matter activist DeRay McKesson was the first to speak at the 12th Annual Brooklyn Hip-Hop Festival's Hip-Hop Institute panel series. Just four days earlier, he was released from East Baton Parish Jail after being arrested during a protest for Alton Sterling. As he stood in front of an audience at Medgar Evans College, McKesson said, "When we think about what's happened over the last 20 months and we think about this past weekend in Baton Rouge, what we know to be true is that this country can be better than it is today." McKesson has been a major force in mobilizing the Black Lives Matter movement through his relentless protest work on the ground, and his transformative approach to organizing through Twitter. Throughout his speech, McKesson made it clear that although he's on the front line, resistance can come in many forms. Here's his speech in full. 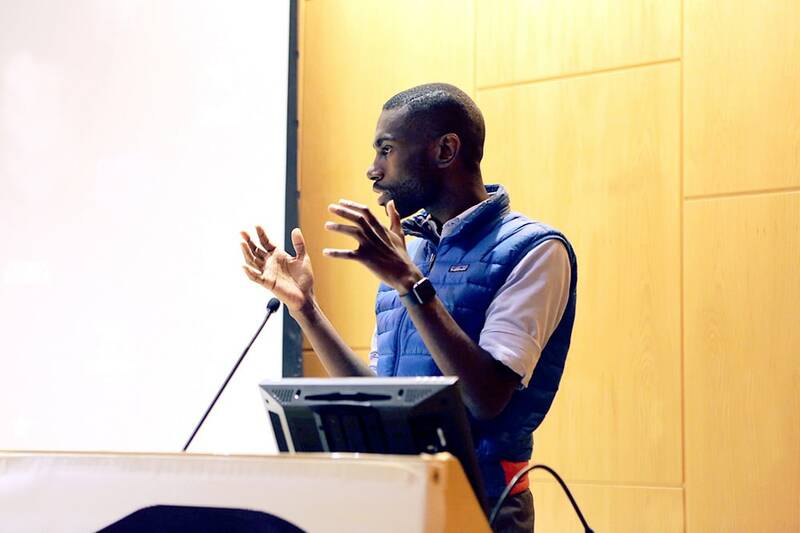 DERAY MCKESSON: When I think about August 2014, I was sitting on my couch and I was looking at what was happening on Twitter and I was looking at what was happening on TV and there was real dissonance. 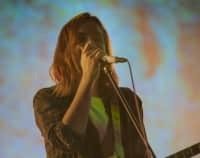 I said, "I want to go and see for myself." I got in my car and went on Facebook that I was going to St. Louis and that I didn't know anybody in the state of Missouri. Then I got a call from someone who said, "We found somewhere for you to sleep," and that was my story. When I got to Ferguson, I thought I was just going for the weekend. I packed three t-shirts, four pair of underwear, a pair of socks and I was ready. And it's been a long 22-month weekend in the movement. I say that because, I just got off the couch and I went down to bear witness. In the beginning, I did not go down to protest. I went down to just go see what the problem was for myself. One of the things that I worry about when it comes to the movement is that when people think about protests, they only think of those of us who stand in the street or only those of us that got arrested. But, what I know to be true is protest is this idea of telling the truth in public. We used our bodies to tell the truth about the fact that Mike should be alive, or Rekia and Ayanna, and John and Tamir. We disrupted board meetings and commissions to know the truth that they weren't using their institutional power in ways that benefited the lives of people of color. So many people can be truth tellers in this space. I've seen people opt out and say, "I'm not a protestor," because they haven't been in the streets with us. But, what I know to be true is that the truth telling work happens everywhere. It happens at the dinner table, it happens in board rooms, and we have to be able to tell the truth wherever we go in this work and that's really important. When think about the role of stories, so much of this is rooted in this understanding that the stories are at the heart of all revolution. The ways that we talk about the world ought to change the ways that we act in the world. I think about the weekend that I was in Baton Rouge and I got arrested and what’s real about it, was telling this narrative about the police who were provoking people. I saw peaceful protestors and I saw violent police. Helping with the trauma that certain people face in communities is so much of the work but we have to remember that talking about the problem is not the end of the work. That is the beginning in figuring out what the solutions are. Protest in and of itself is not the solution. Protests create space for the solution work to happen but I do worry about in the movement sometimes that we get so addicted to talking about the problem because we face the problem so much because we’re in proximity to the problem, that we forget how we can fix the problem. We forget to talk about what the solutions look like and that has to be a core part of our work. The first thing is, I’ve seen so many people criticizing hashtag activism or those people online. We are not born woke, something wakes us up. What’s real is that Twitter, Facebook, and so many of the platforms have been the way that people have been able to access the truth and talk about the truth. I’ll never criticize people for telling the truth. The other thing is there’s a difference between being woke and staying woke. So much of this work is about keeping people woke. I know so many people who understand it today but don’t understand it tomorrow. We have to figure out how to make sure people understand the work at every step of the way. Social media allows people to do that. We think about people of color and we often face these issues of erasure and erasure often manifest in two ways. One is that the story is never told or it’s told by everybody but us, and in this moment we became the other race. We literally were able to tell our stories to each other and build community in ways that we had not imagined before. Think about myself, I had 800 Twitter followers. In August of 2014 I had 490,000 and today I’m able to talk to so many people in a community that’s bigger than mine originally because of these tools and that’s really powerful. The second thing is, when I think about what comes next is our ability to build coalitions. Can we create entrances into the movement for people who might not have the same goals but have the same outcomes? So think about like the environmentalist. We don’t necessarily have the same goals as the environmentalist but we all want to live in a world that doesn’t have dirty water like in Flint. You think about the gun control lobbyist. We don’t have the same goals but we want to live in a world where there aren’t mass murders. I think that the coalition building will have to be what comes next for us and knowing that we can’t win alone. We must be as organized on the inside as we are on the outside. The strategy is not just to win. It’s to fight forever. We have to also be the people on boards, commissions and mayoral seats and city councils and we have to organize there too. What I’ve come to believe especially in the specter of Trump and when I think about the end of the Obama presidency and in all of this, the police themselves are a real test of our ability to organize. Can we actually build a different type of a community with a different type of power? I feel that is a real question for the movement and time will tell if we can or not. When I think about what it means to be an organizer, an organizer is someone who says, “I think the world can be better. Here’s how I want it to be better and let me find other people who believe that with me,” and that’s how the organizing starts. So many people are saying that you have to get a phone call from the ancestors and there’s some playbook and that’s not real. When I think about us, when we're in the streets in Ferguson we didn’t know what we were doing but we knew that the world could be a better place and we tried and we tried and we did it.